Adjust how challenging the game is. This only affects action levels. Note that on extreme difficulty gold dolphins don't give you extra health. These sliders allow you to adjust the music and sound effects independently. You may wish to turn the music all the way down and play your own music in the background. The cheats are accessible from the bottom of the options menu. They are not available until you have completed certain game objectives. If there are any cheats turned on, your stats will not be saved for beating a level. Following is a list of cheats, their effect, and how to attain the cheat. Description: This makes the game have very gravity. It effects your dolphin as well as enemies. How to get: Beat all action levels on very easy or harder. Description: You have unlimited homing torpedoes. How to get: Beat all action levels on easy or harder. Description: There are no more enemies in the game. How to get: Beat all action levels medium or harder. Description: Your dolphin becomes extremely tiny. But he still has the same firepower and health. How to get: Beat all action levels hard or harder. Description: Getting hit by enemies no longer does any damage to you. How to get: Beat all action levels extreme. Description: Your dolphin becomes extremely large. How to get: Collect at least 35 gold dolphins. Description: Every shot from your laser is as if your powered it up. How to get: Collect at least 70 gold dolphins. Description: You always have the 4x damage power-up. How to get: Collect at least 105 gold dolphins. Description: You always have the rapid fire machine gun power-up. How to get: Collect at least 140 gold dolphins. Description: Instead of swimming towards you, your enemies will run away in fear (try using this with mini dolphin). How to get: Collect at least 180 gold dolphins. Description: Always have the laser sword power-up. How to get: Collect at least 215 gold dolphins. Description: Your dolphin is almost completely invisible to the naked eye. Your enemies will only see you if you get very close to them. How to get: Collect at least 250 gold dolphins. Description: You can't see your enemies, but they can see you. How to get: Get 100% enemies destroyed on at least 10 levels. Description: Slows your dolphin down. How to get: Get 100% enemies destroyed on at least 20 levels. Description: Makes all your enemies very tiny. How to get: Get 100% enemies destroyed on at least 30 levels. Description: Makes all your enemies very big. How to get: Get 100% enemies destroyed on at least 40 levels. Description: Fly through the air. Works very well with low gravity. How to get: Get 100% enemies destroyed on at least 50 levels. Description: This is primarily of use in the stunt levels. Lets you keep going and going. How to get: Achieve a bronze medal or higher on all the stunt levels. Description: Lets your dolphin jump super high. How to get: Achieve a silver medal or higher on all the stunt levels. Description: Shows your tricks even when you are not on stunt level. You could be leaping into the air destroying a robo bird and you will notice that you just achieved a double flip with laser fire. How to get: Achieve a gold medal or higher on all the stunt levels. Description: Makes your enemies are impossible to destroy. How to get: Achieve a bronze medal or higher on all the race levels. 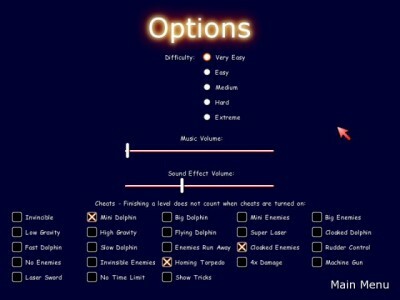 Description: Control the direction that your fin is facing instead of the direction that your dolphin is facing. How to get: Achieve a silver medal or higher on all the race levels. Description: Run through the water at never before seen speeds. How to get: Achieve a gold medal or higher on all the race levels.